The return of Aunt Bonnie! This post is long, long overdue. I started the draft weeks ago and much has transpired since then, but since I haven’t yet taken photos of my progress I’ll start at the beginning. Aunt Bonnie asked me to make her another dress. You all remember Aunt Bonnie, right? My stunning, talented, and delightful aunt who sings for Tampa Bay’s Horn Band, Late Night Brass? She asked me to make her a gown for their performance at the Christmas party of one of the large law firms here in Tampa. It’s one of the most formal gigs they’ll perform this year. The men will all wear tuxes with gold bow ties. And Bonnie as the lone gal on stage thought a gold gown was in order. We started talking about her gold dress back in May, contemplating what pattern might workand what detail work would make the gown really POP. We settled on Vogue 3830, and, with the great advance planning, Bonnie was able to snag the pattern on sale back in June(?). We bought our fabric in July. And now it’s November and things are nearing completion (though I haven’t spent all of the past 3 1/2 months working on this dress; much of that time was spent sewing bras and other fun stuff). Here’s the pattern envelope for Vogue 3830. 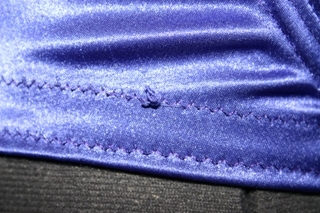 For a change, we’re actually making the dress as the pattern intended (for the most part anyway), in View B. The empire waist is a great look for Bonnie, and the cut of this dress over all is very much her style. The back (below) cuts away except for a narrow band, so it’s a bit showier than the other dresses we’ve made, which is very much in keeping with the formal nature of this event. Now the big busted seamstress in me looks at a stunning but narrow-strapped gown like this and thinks “we need to add some support.” And since I was merrily sewing up bra after bra while we were planning this, and since that band across the back even looks reminiscent of a bra, I suggested we sew a bra right into the dress, custom sized to fit the dress dimensions, custom dyed to match, and far more supportive than the dress on its own would be. And that brings you up to speed with my progress as of about a month ago. In the time since then, Bonnie has learned that Late Night Brass will play two formal charity balls this November, which pushed our time frame up from the first week of December to this coming Saturday. And also in that time, I have learned how very, very, very time consuming beadwork is. The endless sewing has kept me busy and I blame my enthusiasm as a seamstress for my slacking as a blogger. But photos, descriptions of my process, and many more posts will follow soon!